Mother’s Day is coming up soon! Now I don’t know what the kids are going to do for me, but there are also some other moms that we need to get gifts for. More specifically, the children’s grandmothers and that means I need some Mother’s Day gift ideas. This year, the kids and I decided to make homemade gifts. So we started a Pinterest Board and pinned all the Mother’s Day gift ideas that we really liked. There were so many great projects that any mom would love that I had to share them with all of you in case you (or your hubby) are looking for Mother’s Day Gift Ideas. Mama Papa Bubba is one of my favourite places to get great ideas for projects to do with the kids. This Ring Dish had caught my eye a long time ago and Mothers’ Day was the perfect opportunity to try it out. Just make sure to get a good quality air-dry clay. I learned the hard way during our first attempt that dollar store clay wouldn’t cut it, when a bunch of the fingers broke off! 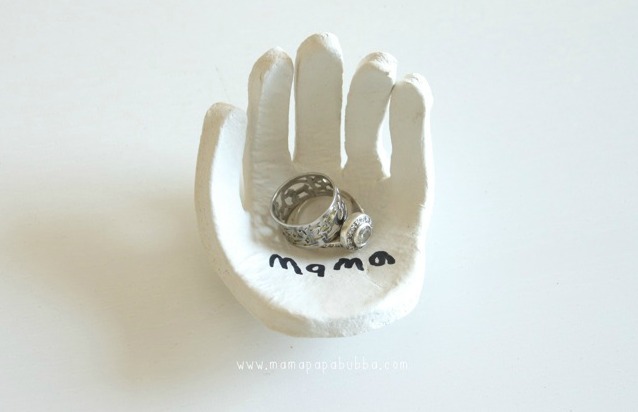 The finished product is so lovely and mom (or grandma) will love taking of her rings to put in their special holder. Any mother will wear this charm necklace with pride. It’s so pretty and the fact that it’s personalized makes it even more special. With a little help from an adult, these would be a great Mother’s Day project for the kids. 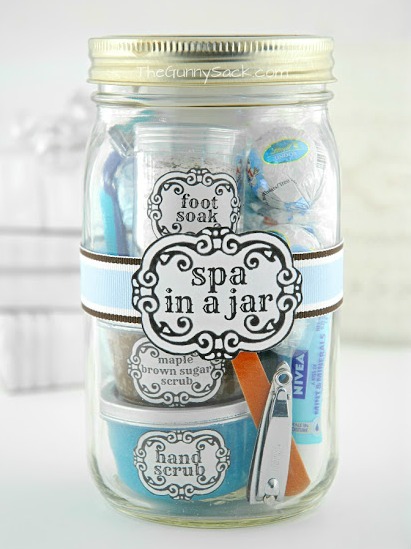 Love this Spa in a Jar idea as a Mother’s Day gift! As moms, we often don’t get the time to go out and pamper ourselves. But, it’s nice to have everything on hand if you ever have a small chunk of time at home to give yourself a little self pampering with a mini mani or pedi. This next idea is cute and practical. 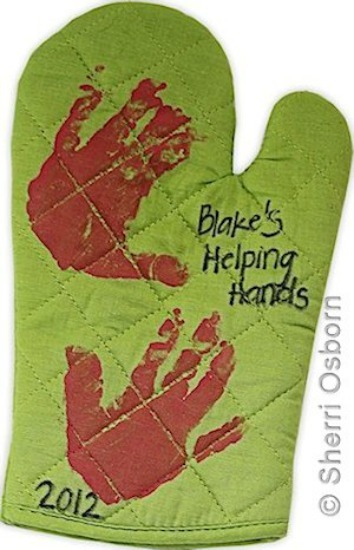 All you need is a pair of plain oven mitts, fabric paint and permanent maker and you have a gift that will make any mother smile each time she takes something out of the the oven. 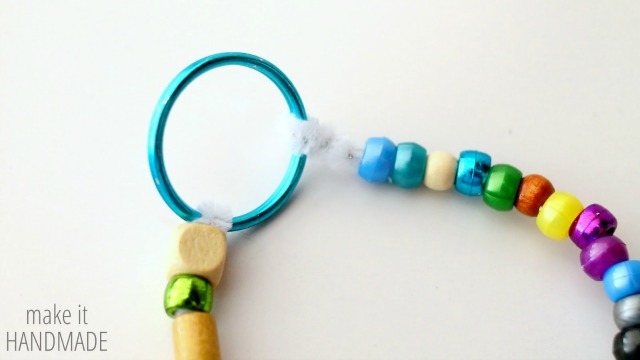 If you’re looking for a Mother’s Day gift idea that even a toddler can make, this beaded keychain is perfect. It’s really simple and mom or grandma will be able to take it with her everywhere. If you want more ideas, make sure to check out my Mother’s Day Gift Ideas check out this other Mother’s Day Gift Ideas post! 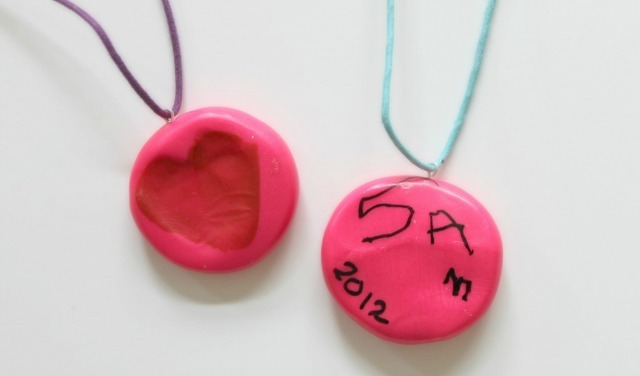 Love these ideas – growing up my mom loved our hand made gifts the most. She still uses the Hand-Shaped Ring Dish! The spa in the jar is so new and creative – think i may give that a try this year! I’m so glad one of these ideas inspired you. I’m sure your mom will love the spa in the jar! I really like the thumbprint necklace too! The ring dish is super cute!! Such great ideas! These are really neat mother’s day gifts. I am going to check that ring dish in shape of a hand.